Birth date and place 11 Aug 1830 Drumclift, Ennis, Clare, Ireland. Baptism date and place Diocese of Killaloe baptisms not extant before 1841. Physical Description Height: 5 ft. 8 ins. Complexion: fresh. Eyes: dark blue. Hair: black. Marriage date and place 4 Oct 1856 Drumclift, Ennis, Clare. Children John b. 1857, Drumclift, Ennis, Clare, Ireland. Mary Anne b. 1862, Drumclift, Ennis, Clare, Ireland. Bridget b. 1860, Drumclift, Ennis, Clare, Ireland. Note: the above children did not arrive in Western Australia, thus probably died as infants. Michael b. 1863, Drumclift, Ennis, Clare, Ireland. John b. 1865, Fremantle, Western Australia. Francis b. 1868 (d.1873), York, Western Australia. Mary Matilda b. 1870, Perth, Western Australia. Peter b. 1872 (d.1873), Perth, Western Australia.
? Patrick Joseph b. 1873 [Erickson & EP Cemetery records only]. Death date and place 26 Apr 1893 Murray Street, Perth, WA. 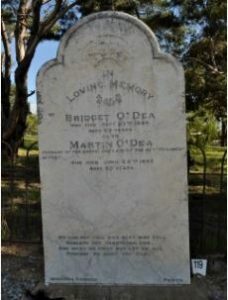 Burial date and place 27 Apr 1893 R.C. Section, East Perth Cemetery, Western Australia. 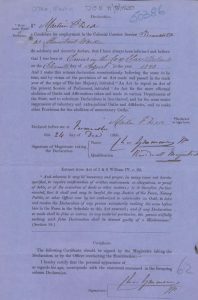 Will and Probate Will: 13 Jul 1891. 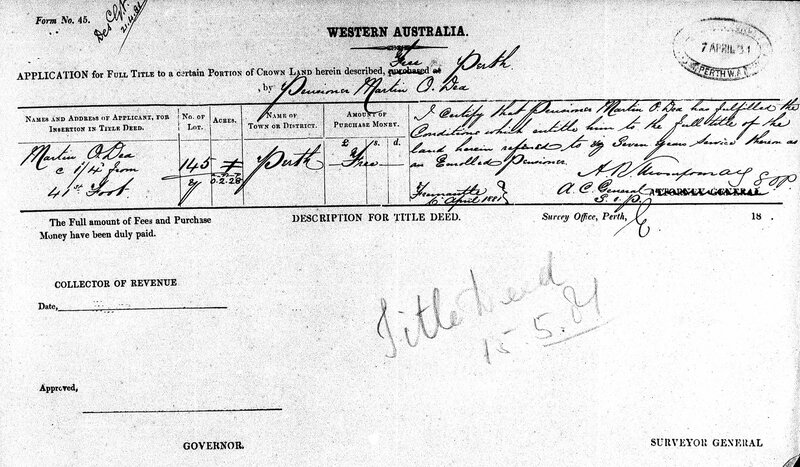 Probate: 4 May 1893, Supreme Court of Western Australia. 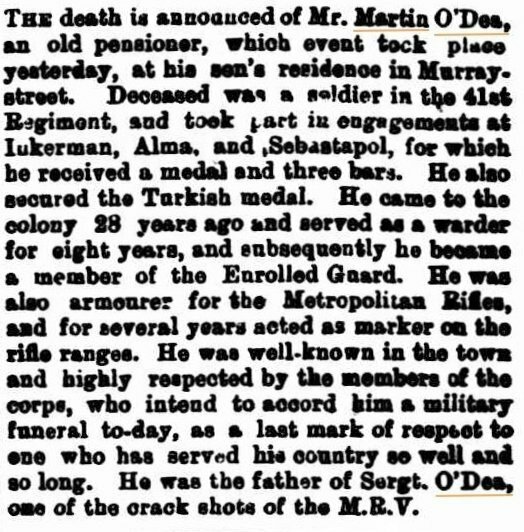 Death Notices and Obituaries West Australian 27 & 29 Apr 1893. Inquirer & Commercial News 5 May 1893. Regiment No. and Rank #2584 Private. 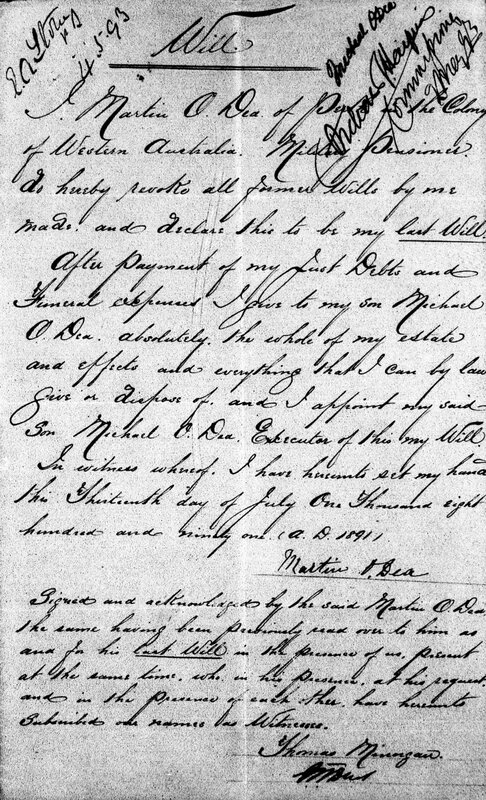 Attestation date and place 31 Aug 1848 Buttevant, Cork. Malta & Turkey 1 year 1 month. Crimea 1 year 7 months. Musters 1851 Cork & At Sea [WO12-5447]. 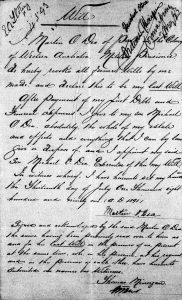 Promotions Private to Corporal 7 Jul 1855. Medals, Clasps and Badges Crimean War Medal clasps Alma, Inkermann, Sebastopol. Turkish Crimea Medal. Casualty/Medical Casualty Roll: Severe Wound. Final Attack on the Redan 08 September 1855. Also slight wound 04 Aug 1855. Medically unfit for further service. [Note: Medical Report from p.3 of WO97 Discharge documents not extant]. 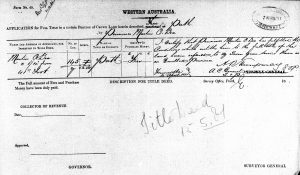 Courts Martial in Western Australia From an unknown date 3rd Quarter 1874 to c. 9 Jun 1875, O’Dea was in Fremantle Prison, offence unknown. See WO23-58-3 and M S James p.620 for reference. Discharge date and place 18 Mar 1856 Templemore ? Length of Service 7 years 201 days. Chelsea Pension Reference WO97/1518/3-4. Box Record pages 3-4 are missing. Some details sourced from M S James p.620. Post Discharge Residence Ennis, Co. Clare. 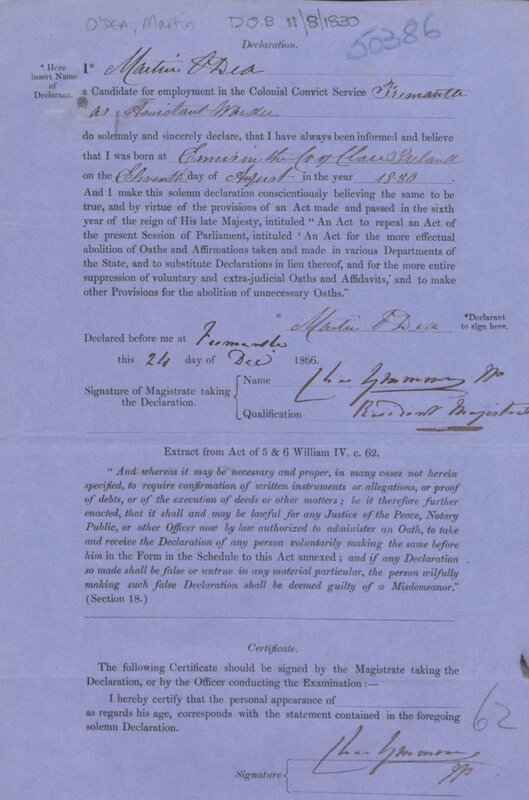 Post Discharge Pension District Ennis (1856). Fremantle (1865). Perth (1875). Pension Amount 1/- per diem. Increased to 1/4d. per diem 1885. Departure and Arrival 30 Sep 1865 Portland; 22 Dec 1865 Fremantle. Status/Occupation Enrolled Pensioner Force 1865 to Dec 1866. Assistant Warder Dec 1866 to Mar 1870 [Barker p.162]. Land Grant/Purchase 15 May 1881 Lot Y145 Perth (grant).